Much of the content of Xanathar's Guide to Everything is composed of the final, official version of material originally presented in "Unearthed Arcana" (UA) articles on the Wizards of the Coast D&D website. 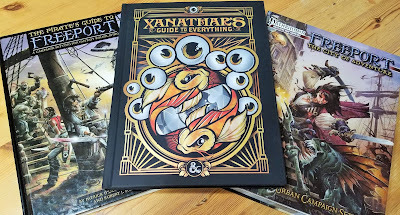 Reviewing the book with an eye to using it in Freeport games will involve revisiting that material, so much of what I say here has been compiled from my past "Unearthed Arcana and Freeport" columns. This first installment will just cover the subclasses from Chapter 1: Character Options. Freeport sees a diverse mix of barbarians pass through its waters, so these three new primal paths could prove quite useful in making each barbarian culture distinct. For example, The Path of the Ancestral Guardian would be suitable for many primitive islander tribes. Druzhdin barbarians are frequently berserkers or totem warriors, but the tundra aura of the Path of the Storm Herald also fits their homeland quite nicely. Azhar barbarians are a natural fit for the desert storm aura option for that path. Savage humanoids with a strong war-god cult (like the orc god Krom) could be drawn to the Path of the Zealot as easily as to that of the berserker. The College of Glamour is designed for bards with ties to the Feywild, and is a natural fit for the elves of Rolland. The College of Swords will be attractive to bards who want to be more deadly in melee combat--and in Freeport, who doesn't? The College of Whispers focuses on infiltration and leveraging secrets, and is thus perfectly suited for the intrigue-riddled streets of Freeport. The Forge Domain is appropriate for dwarven gods, as well as fire-based religions like Kizmir's Eternal Flame. The Grave Domain is designed for death-oriented gods who oppose undead, and is thus an excellent choice for the Church of Retribution and its Inquisition. For Freeport campaigns using The Book of the Righteous, the Forge Domain would be appropriate to gods that grant either the Creation or Fire Domain from that book, while the Grave Domain roughly corresponds to the Repose Domain. Druids are almost always outsiders in Freeport, and usually feel more at home in the jungles of the Serpent's Teeth than in the city. The Circle of Dreams is a good fit for wood elves from Rolland, while the Circle of the Shepherd would be a good choice for any druid who wants to protect the islands' native creatures. The "Learning Beast Shapes" section provides useful reference tables, but lacks the more detailed rules from the "Druid" UA article. The Way of the Drunken Master is a classic martial arts archetype, suitable for Eastern Empire monks. Monks who follow the Way of the Kensei gain additional training with weapons, providing them with more weapon proficiencies and more tricks in combat. The Way of the Sun Soul is reprinted from the Sword Coast Adventurer's Guide. These monks are most appropriate to temples that revere gods of light (such as the Hamunaptran sun cult). A paladin with the Oath of Conquest seeks to subjugate his enemies, not merely defeat them. These paladins exist alongside the Oathbreaker from the DMG, and often have ties to the devils of Hell. Even in Freeport, hellknights rarely act openly--the worship of devils or demons is among the city's very few capital crimes. An Oath of Redemption paladin is dedicated to peace, which is an especially difficult ideal on the rough streets of Freeport. A Gloom Stalker (previously known as the "Deep Stalker") would be a useful addition to any party braving the jungles of A'Val or the sewers and caverns below Freeport itself. The Horizon Walker will have plenty of work in Freeport seeking out planar portals and the threats they can unleash (possibly leading to encounters with hellknights!). The Monster Slayer will have plenty of targets to choose from in the Serpent's Teeth. This subclass (originally a reimagining of UA's Monster Hunter archetype for fighters) makes an excellent choice for converting the monster hunter class from the 3rd Era Freeport Companion or the Pathfinder edition of Freeport: The City of Adventure. The Inquisitive is a master at observation and spotting enemies' weakness. The Scout is an expert at woodcraft, mobility, and group tactics. Either subclass will enhance the effectiveness of any party that prefers stealth and advance warning to simply running headlong into trouble, especially at higher levels. The Mastermind and Swashbuckler are reprinted from the Sword Coast Adventurer's Guide (though the latter first appeared in UA). The Mastermind will thrive in the intrigue-heavy atmosphere of Freeport, while the Swashbuckler is a common sight in Freeport's streets and taverns, as well as many of its ships' crews. The Divine Soul (previously "Favored Soul," in its various iterations in UA) is a vessel of divine magic, and likely to swear allegiance to a deity, though not always to the god's church. They are often encountered as the charismatic leaders of cults (of any alignment). Shadow Magic sorcerers will find numerous illicit uses for their powers in a city as "shady" as Freeport. The city is known to have at least one site where the borders between the Material Plane and the Shadowfell are quite thin, which would likely be tied to the origin of any homegrown shadow sorcerers. Storm Sorcery is reprinted from the Sword Coast Adventurer's Guide (though it first appeared in UA). Control of the winds will make these sorcerers highly popular among ships' crews who do are not overly superstitious about strange magic. The Celestial provides an overtly good-aligned option for the usually sinister warlock class. Such characters are quite rare, especially in Freeport, but may be drawn to that city in order to purify some evil or improve the lot of the common folk. The Hexblade has ties to the Shadowfell, so they are likely to be interested in the elusive places near Freeport where the barriers between the material and shadow worlds grow thin. Several new eldritch invocations are provided as well. These have been divorced from specific patrons since their first appearance in UA, which opens them up for use by more warlocks. Only one new subclass is presented for wizards: the War Mage. Combat-trained wizards are a common sight in Freeport, and may have acquired their skills at the city's Wizards Guild or at a military academy on the Continent. Bard: College of Satire ("Kits of Old," 1/4/2016). Cleric: City Domain* ("Modern Magic," 8/3/2015), Protection Domain ("Cleric: Divine Domains," 11/21/2016). Fighter: Sharpshooter ("Fighter: Martial Archetypes," 12/5/2016). Monk: Way of Tranquility ("Monk: Monastic Traditions," 12/12/2016). Paladin: Oath of Treachery ("Paladin: Sacred Oaths," 12/19/2016). Ranger: Primeval Guardian ("Ranger and Rogue," 1/16/2017). Sorcerer: Phoenix Sorcery, Sea Sorcery, Stone Sorcery ("Sorcerer," 2/6/2017). Warlock: Ghost in the Machine* ("Modern Magic," 8/3/2015), The Raven Queen ("Warlock and Wizard," 2/3/2017), The Seeker ("The Faithful," 8/1/2016). Wizard: Lore Mastery ("Warlock and Wizard," 2/3/2017), Technomancy* ("Modern Magic," 8/3/2015), Theurgy ("Wizard Revisited," 3/20/2017). Asterisked options, from "Modern Magic," are not appropriate to Freeport's medieval to Renaissance-level technology.